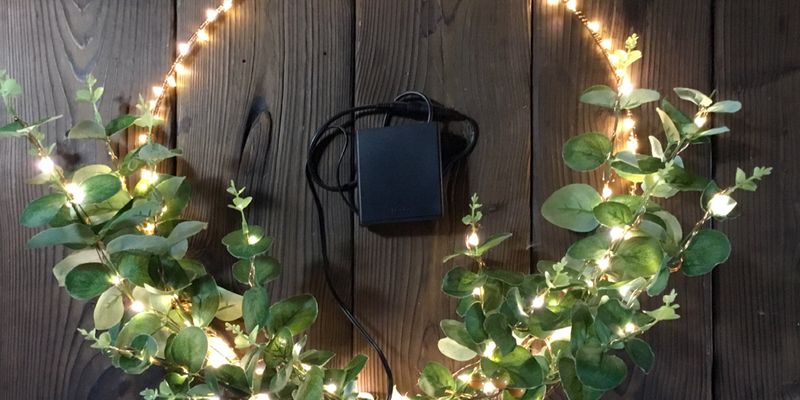 Arrangements aren't just in vases anymore and now you can add the whimsical twinkling light from our Fairy Star Lights! 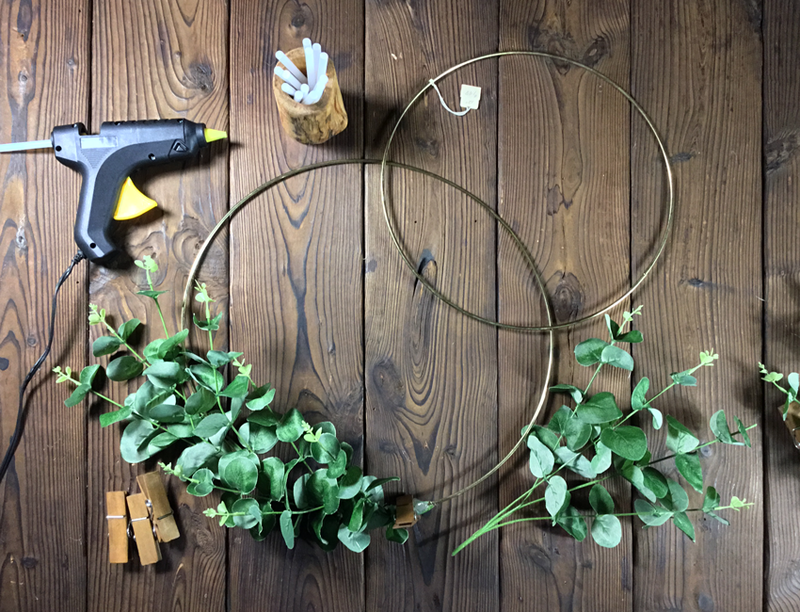 This is a very easy tutorial that shows you how to make your very own simple foliage wreathes to hang proudly on the wall or front door thanks to the included battery pack! 1. Take your branches and trim the bottom. My branches came with 4 sprigs to each bundle so I kept all 4 together for the bulk of one side. Then took the other bundle and separated it so I had 1 sprig of 2 and 1 single sprigs of Eucalyptus. 2. I glued the first bundle of 4 mid way on the hoop. Then layered in the other branches. A helpful technique was placing them and clipping them with big clothespins then using the hot glue gun to glue them in place. 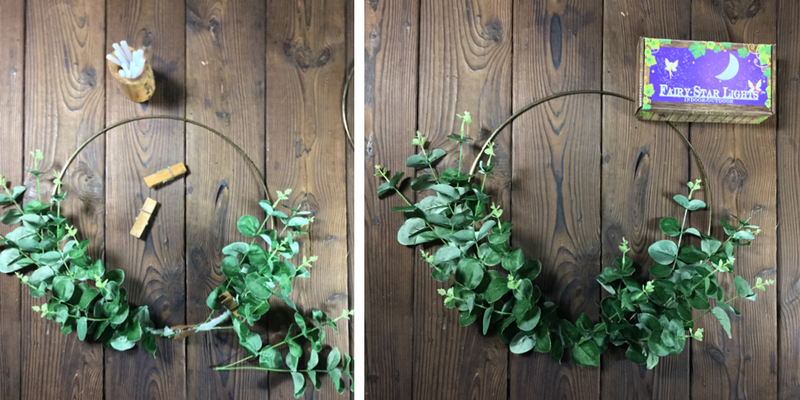 If you have fake Eucalyptus branches each spring should have a pliable wire inside, so make sure to bend the branches around the hoop. 3. Continue to clip and glue down making sure the bushes tapper down like in the image to the right. 4. With one side done continue with the opposite side using the bundle of 4 Eucalyptus sprigs mid way directly across from the other side. 5. Finish the middle by gluing the fake fruit in the centre. 6. Next we're going to begin looping in the Fairy Star lights. Start as close as you can to the branches tapping down the lights where you start for now. 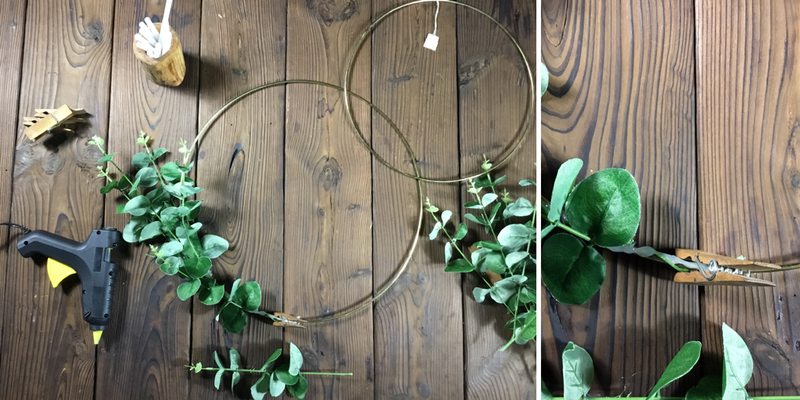 Then work your copper string lights tightly around the hoop, be generous with the lights around the exposed hoop you will have enough of the lights. 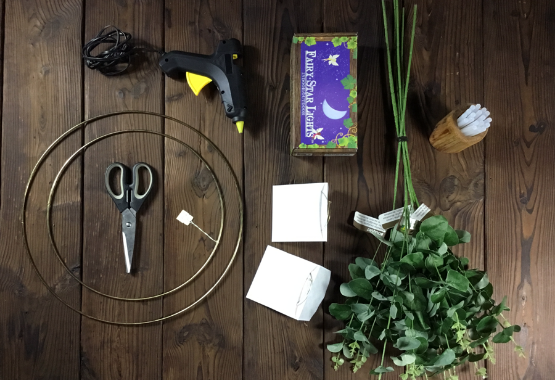 The best way to do this is to use a cardboard tube to hold the string lights as you can see in the image to the left. 7. 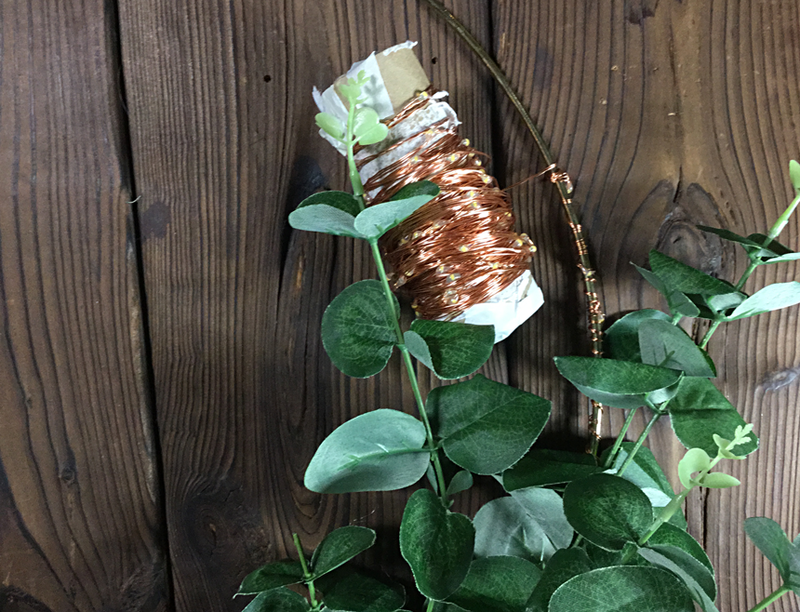 Once the hoop is done use the remaining copper string lights to weave into the Eucalyptus branches, I had enough to cover every branch in twinkling lights! 8. 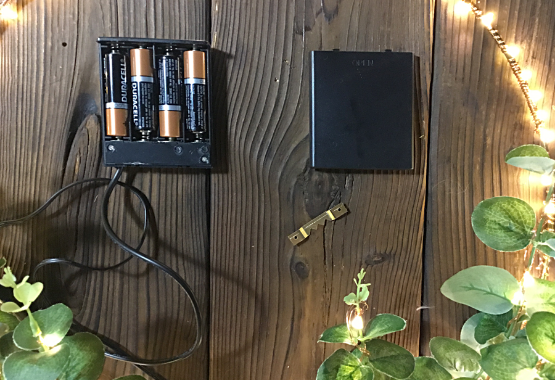 I took my small Saw Tooth Hanger from my picture hanging kit and glued it to the cover of the battery pack. I glued it to the cover and no the side with the on/off switch. 9. I tied the fishing line to the hoop and tied it to a screw eye to mount on my wall. 10. 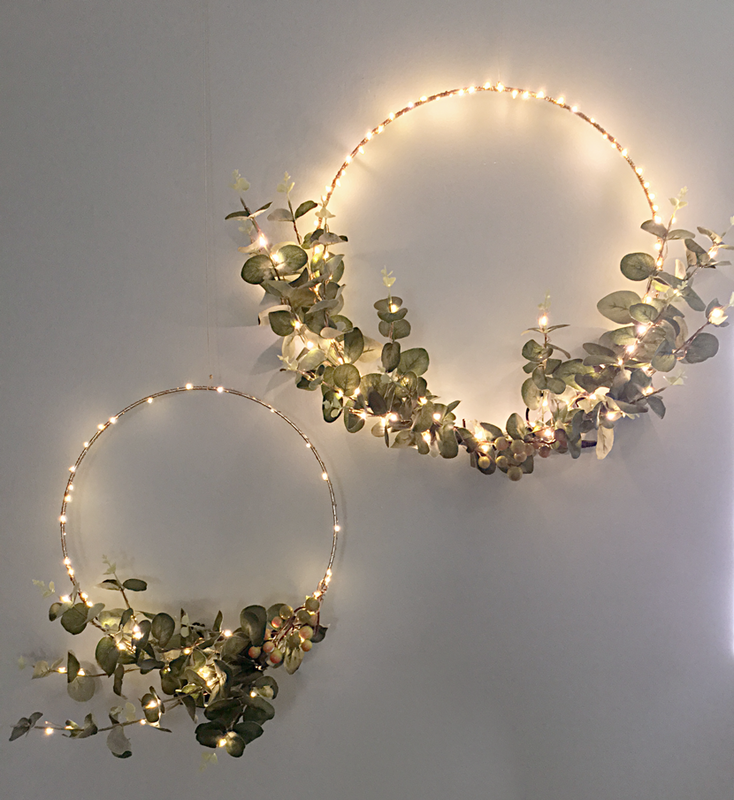 Finally I hung up my wreaths and hid the battery pack behind the bulk of the Eucalyptus leaves! 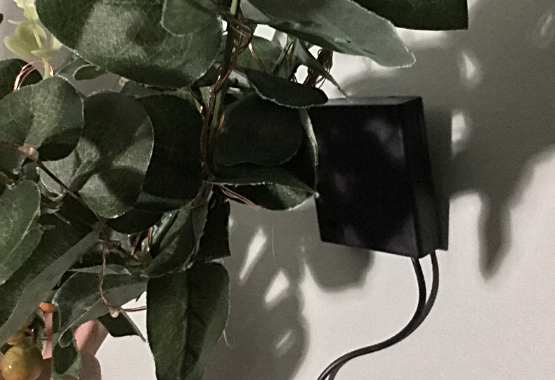 Finally i placed the IR receiver for the remote just poking through the branches so that I could turn them on with the press of a button! 11. Repeat this process for the second smaller hoop. For the second one I decided to go with an asymmetrical design and it turned out wonderfully! 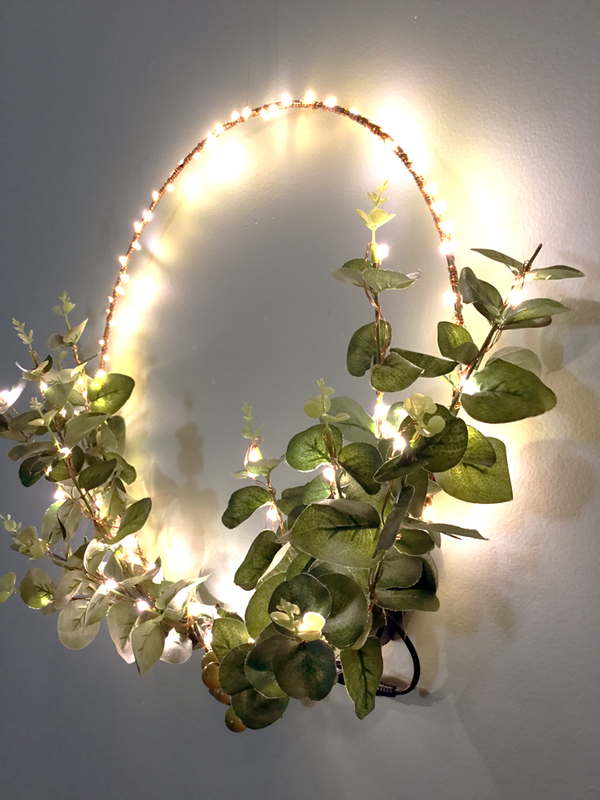 * As a comparison I bought another brand of fairy lights for the smaller design and you can definitely see the difference in the amount of lights and the brightness! The other brand cost me $11.59 before tax, was much shorter, did not come with a wall plug or remote control and not as bright!